The French-English neighborhood of St. Norbert is a beautiful area in the Manitoba province. There are several historical buildings scattered through St. Norbert, attracting many visitors interested in the stunning architecture. What else does St. Norbert have to offer- an extreme climate for patrons to prepare for! Humidity in St. Norbert is severely high in the summer making indoor spaces quite uncomfortable. On the other hand, winters in St. Norbert can be frigid, and residents may have trouble staying ahead of the cold without effectively running heating systems. After more than 20 years of witnessing this climate first hand, Provincial Heating & Cooling has a few tricks to stay ahead of the seasonal changes. We provide exceptional services for our customers while offering the best equipment capable of keeping up with the continental climate of St. Norbert. During the humid season, we focus on decreasing the moisture in the air to cool your space quicker. And when there’s a chill in the dry air, we’ll make sure your heating unit is in tip-top shape for eliminating that mid-winter freeze. Provincial Heating & Cooling provides you with the most exceptional HVAC services available in both residential and commercial spaces. Whether you need an AC repair done on your current unit or are looking for a recommendation on a new one, our expert technicians are eager to help! Our award-winning staff serves as leaders in the industry. We offer no less than quality work and extraordinary customer service. As a part of the St. Norbert community, we value environmentally friendly techniques to keep our neighborhoods healthy and safe. 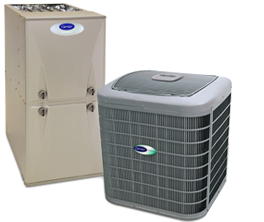 Provincial Heating & Cooling is a Carrier Factory Authorized Dealer for the world-class Carrier products. We only suggest the top of the line equipment when our customers are looking to upgrade and have been extensively trained on these units to ensure a successful installation. And make sure these units continue to run in excellent condition, we extend a comprehensive Pro Service Plan, with affordable preventative maintenance on your HVAC units included. We want our customers to be worry-free, and with our 24hrs a day service and 100% Satisfaction Guarantee, we know they will be! St. Norbert weather is going to test your systems. Luckily, Provincial Heating & Cooling is up for the challenge of keeping them going strong. Contact us today for a free estimate of your residential or commercial property!